The roof of your home is an investment in the safety and security of the people and property under it. Generally speaking, shingle roofs should last upwards of 20+ years. However, many factors, such as proper installation, climate, and ventilation, impact the life of your roof. Even if your roof shows signs of the symptoms mentioned below you may not need a total roof replacement. 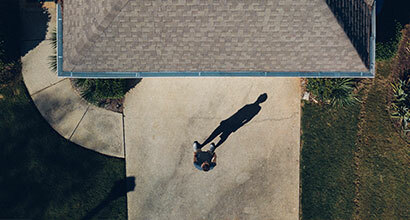 This DIY guide on "10 Signs That Your Roof Is Going Bad," reviews a few of the preliminary signs you can review yourself before calling a roofer for your professional roof inspection. If you do decide to venture on ladders or on your roof yourself, make sure all safety measures are in place including but not limited to wearing safety harnesses, ensuring the stability of ladders on the ground and understanding where you can and cannot walk on your roof. Roofing contractors and roofing companies take the guess work out of the roof inspection process, are well trained and experienced on how to conduct a safe and thorough inspection. Check for discolored spots on the ceiling, damp or dripping spots when it rains. For a house you are buying, look closely at the ceiling around chimneys, skylights and corners from roof valleys. Frequently this is where water enters. You may need a roof leak repair or it could mean repairs to your piping or gutters. They first appear as gravel or dirt in the gutters or along the drip line of the roof. Get above the shingles, or get away from the house and use binoculars to look for holes which expose asphalt or fiberglass mat. You need to look for dark spots on your roof, usually localized discoloration. Algea grows often in shady areas on the roof. Bumps appear on or more ridges along the 'flats' of the roof. These ridges may be in any direction. Keep an eye on the corners of the tabs for curling either up or down. In DeLand or Deltona area as well as high wind prone areas on the Volusia coast, if this is not repaired early, you may lose your roof to the wind. Bent metal around the chimney or sky lights are signs of damaged flashing that needs further inspection by a roofer. Shingles protect the integrity of your roof. Correct as soon as possible to prevent further, more serious damage. Tabs will flap in the wind and could detach completely. Have those specific shingles sealed with flashing cement. Find shingles that appear to be falling apart or have holes. Check the attic for water damage, proper ventilation and/or rot. Check for shingles that have bubbles or significant bumps (1/2 inch high). Check the attic for proper ventilation. Our experienced craftsmen at RDG Roofing are fully trained in the installation and repair of a diverse range of roof systems suitable for residential roofing. We can give your roof a thorough inspection and let you know if you are in need of a new roof, or just a few roof repairs. We're located in DeLand servicing DeLand, Deltona, Orange City, DeBary, Daytona Beach, Ormond Beach, New Smyrna Beach and surrounding cities, so give us a call and discover how we can take the guesswork out of your roofing concerns.